We believe everyone has the potential to be great at something, but sometimes a person needs a little help discovering what that "something" is! That's where we come in. 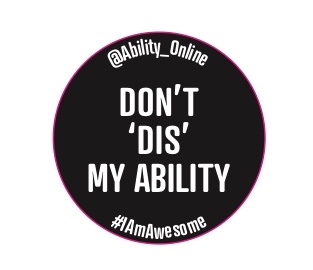 Ability Online takes the "dis" out of disability, encouraging our members to focus on their abilities - what they can do, not what they can't do. As part of our Don't "dis" my ability initiative, we will be sharing the stories of our members who have chosen to focus on their abilities, allowing them to accomplish great things. Stories are posted on our blog, but we also invite people to send in their story to My Story or join the site and meet our role models and mentors and keep the conversation going.